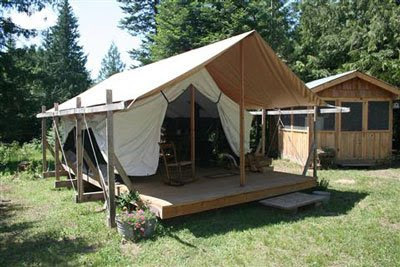 The Colorado Yurt company makes these seemingly well sorted out Cabin Tents. Designed to be set up on a permanent platform, these seem like a good solution for family summer camp housing. 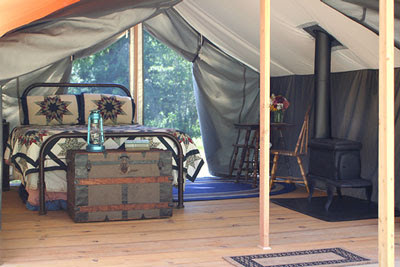 Equipped with a woodstove and screening on all four sides, you could extend your stays well into the shoulder seasons. You could pull the tent down and store the tent, stove and whatever furnishings in a large storage shed, bunkhouse, cookhouse or other permanent structure, leaving only the platform exposed to the winter elements. The plaform construction makes this is a particularly good solution for hilly or uneven terrain such as a river bank or lakeside setting. 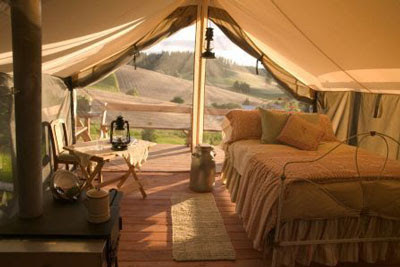 And of course, the company makes Yurts and Teepee's should your tastes run in that direction.